Author DougPosted on August 20, 2018 August 20, 2018 Categories Diabetes, Diabetes Medications, Insulin ResistanceLeave a comment on High Blood Sugar Without Side Effects? The interesting part is that some of the diabetics were looked at both before and after insulin therapy. Eight Type 2 diabetic patients were re-studied after a period of insulin therapy. In the following analysis, take note that the group put on Insulin therapy was a subset of the original group of Diabetics so their numbers were different (more exaggerated) from the rest of the Diabetics group. The group on the Insulin treatment saw their BMI increase from 28.2 to 29.6 kg/m^2. Insulin treatment reduced the BMR of the Diabetics (115.5 ± 5.6 to 103.1 ± 5.7). It is question begging whether the lowered BMR caused the BMI increase with Insulin. Not surprisingly the Type 2 Diabetics were producing glucose from their livers at significantly higher rates than the control group. Insulin therapy decreased glucose production (1133 ± 92 to 983 ± 80). In theory this is good. A possible explanation of the effect of Insulin is that it took more insulin to overcome the Insulin Resistance of the liver. Insulin therapy isn’t a great long term solution, though, since the liver will eventually become even more Insulin Resistant and require ever increasing levels of exogenous Insulin. Lipid oxidation was increased in Type 2 diabetic patients compared with control subjects (1.68 ± 0.05 vs 1.37 ± 0.08 μmol · kg LBM−1 · min−1‘; p <0.01) and decreased significantly after insulin therapy (p<0.05). So, putting someone on Insulin reduces their fat oxidation rate. If Type 2 Diabetes is a problem of fat build-up then Insulin therapy isn’t helping. It’s making Diabetics fatter. Yes, it is driving down Serum Glucose levels in the short term. Of note is the difference in the Fasting Serum Insulin levels between the Diabetics (64 ± 5) and the control group (37 ± 4). The subset of the Diabetics put on Insulin therapy had higher Fasting Insulin levels than the lumped group of all diabetics. With the addition of exogenous Insulin therapy the Fasting Serum Insulin levels in the Diabetic (subset) increased from 84 to 132. That would, of course, indicate that the part of the Diabetics group that was not put on Insulin had a much lower fasting Insulin level. 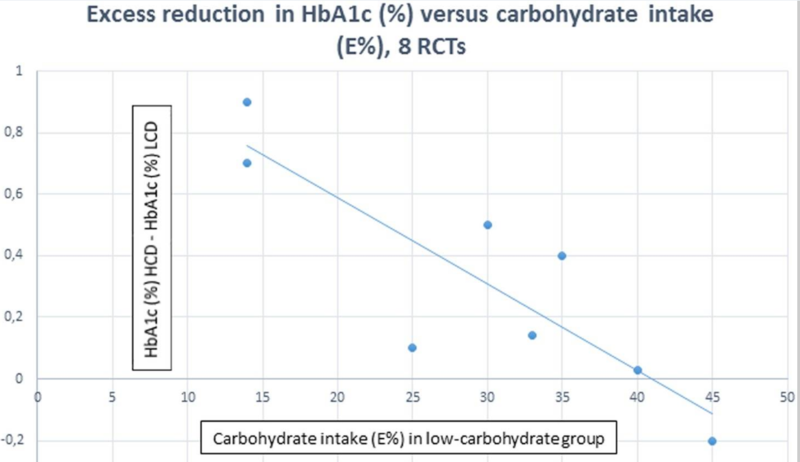 This is interesting given that the error bar was ±5 so the group put on Insulin therapy at 84 +± 11 was many standard deviations out of the entire group. The paradox here is that even with higher fasting insulin levels the fat oxidation rate in the diabetics indicates that the additional fasting insulin levels didn’t seem to stop the diabetics from being able to burn fat. The paradox is that the fat oxidation rate decreased with Insulin Therapy which would indicate the opposite conclusion. This fits the hypothesis that Insulin Resistance in the liver is a primary driver rather than insulin resistance in adipose cells. Calories out is much more complicated than just a number on a paper.